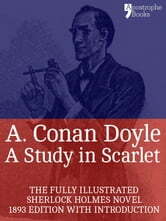 The definitive e-book version of A Study In Scarlet, the brilliant detective novel that first introduced the world to Sherlock Holmes. Complete with the stunning illustrations and typographic flourishes of the 1893 publication of Arthur Conan Doyle’s story, we see Dr Watson move into Holmes’ flat at 221B Baker Street. Soon, the pair are investigating a murder at an abandoned manor, where a mysterious message has been left in blood on one wall – and we begin to see the genius of Holmes’ detective mind at work. 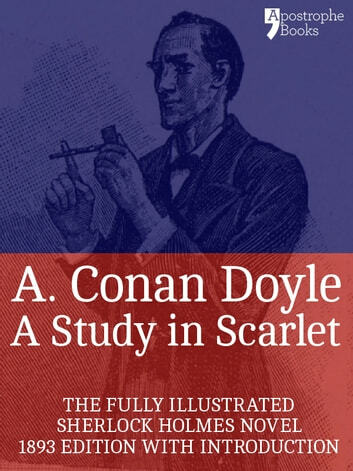 This beautiful, painstakingly-produced Apostrophe Books version of A Study In Scarlet includes an introduction about Sherlock Holmes by Dr Joseph Bell and original illustrations by George Hutchinson.